With tablets and ultraportables garnering so much attention, you might not have noticed how thin and light desktop replacements have become. You'll need an extra-tall backpack to accommodate the Toshiba Satellite P75-A7200 with its 17.3-inch display, but this machine actually weighs two ounces less than Dell's Latitude E6540, which has only a 15.5-inch screen. Okay, so 7.5 pounds with the AC adapter won't win over any Macbook Air fans. But for many, this laptop's extra screen real estate, super-comfortable keyboard, and second hard drive bay will make it worthwhile to tote around a couple of extra pounds. Also, while the MSRP is $955, you may find it street-priced as low as $800. 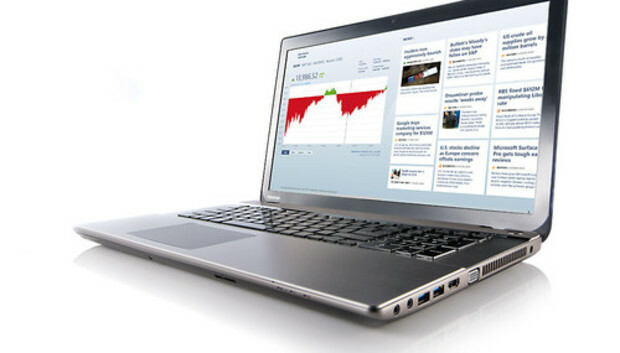 The Satellite P75-A7200 houses Intel's fully threaded quad-core Core i7-4700QM CPU feeding off of 8MB of DDR3/1600 memory. The hard drive is a 750GB, 5400-rpm unit that delivers capacity, but not scintillating performance. Put an SSD in this laptop, and it'll scream. That brings us to one of the major perquisites of this particular desktop replacement: a second drive bay. Loosen a single captive screw on the P75-A7200's bottom access panel, and not only can you easily add an SSD or second hard drive, you'll find two open SODIMM slots for adding more memory. You can't make up for the absence of a discrete graphics processor, though; Toshiba relies entirely on integrated graphics. The display is a large (17.3-inch), 1920 by 1080 widescreen (nontouch), but I was disappointed to see only a DVD burner in its chassis. A Blu-ray player/DVD burner would have taken better advantage of that screen (you'd think Blu-ray drives would be standard on laptops in this class by now). That said, video looks superb. The P75-A7200's speakers complement the display by delivering more than the usual amount of bass--it's light-years better than most laptops. The P75-A7200 delivered a Notebook WorldBench 8.1 score of 279 on our WorldBench 8.1 test suite. Compared to similar laptops running hard drives, that's a good score. Subjectively, the P75-A7200 feels responsive, especially after the Windows 8 Home operating system has finished caching. I can't say the same about its gaming performance. BioShock Infinite chugged along at 38 frames per second even at a resolution of 1024 by 768. But that's to be expected with Intel's integrated graphics, fourth-generation HD 4600 or no. If you really want to game, you need a dedicated AMD or Nvidia GPU. The P75-A7200's 3-hour, 24-minute battery life is disappointing, considering its reliance on integrated graphics. It definitely won't keep you going for an entire cross-country flight, although the proliferation of AC ports on airplanes mitgates that once-upon-a-time deal breaker for many travelers. The P75-A7200's external connections are mostly top-notch: It has four USB ports and all of them are 3.0. The two on the left side are always on for charging. It also has both VGA and HDMI output, as well as an SDHC card slot on the lower half in the front. The ethernet is gigabit, but the Intel Centrino N-2230 802.11n Wi-Fi adapter operates only on the crowded 2.4GHz band (it does, however, support Bluetooth 4.0). The Satellite P75-A7200's ergonomics rise almost to Lenovo quality: The keyboard has a slightly soft feel, but it took only a minute or two to adjust to it and set up a good typing rhythm. The layout is spacious for a laptop (yet another advantage of desktop replacements), with a nice gap between the main section and the numeric keypad. Another nice touch: small dots that glow when the caps-lock and number-lock keys are engaged. The touchpad is first-rate, with no perceivable wobble, a velvety response, and just the right amount of resistance when you press down to click. Note that the display is nontouch, which may irk some Windows 8 users. Then again, touch hasn't proven to be the killer feature than Microsoft hoped it would be. Grab a nice Start Menu replacement and pretend you're using Windows 7, then switch at your leisure to the modern UI for a few of the cooler apps. There's a lot to like about the Satellite P75-A7200. It's affordable, fast out of the box, easily made faster with more memory and an SSD, and the display and input ergonomics are first rate. If Toshiba had included discrete graphics, this machine would be a major winner. But if you don't intend to play hard-core games on your desktop replacement, that might not matter.